<< PREVIOUS: What’s With the Olive Ridley? Skimboarding is a lot like skateboarding on waves. Unlike surfers who grab the crests of large waves just before they break, skimboarders start on the beach and glide into the face of a breaking wave and skim the rippling water that follows the break. Skimboards are shorter, thinner and wider than surfboards and lack fins, the better to slide into a wave. The boards are made of wood, but are technologically very advanced since shape, weight and size are key to performing acrobatic feats on water. 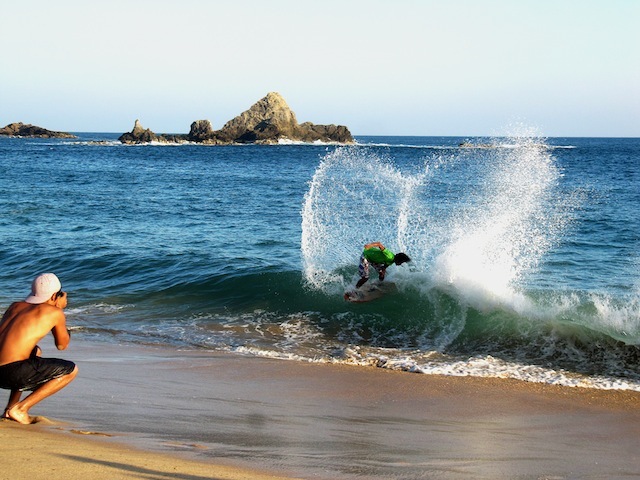 Mazunte is an ideal location for this sport, because of how its waves break near the shore. So it was that in November, for the third time in four years, Mazunte was the site of the international skimboard competition, the Battles of the Crab (Batallas del Congrejo). The events took place over two afternoons, with competitions in various catagories. The big winner was Cesar Lazareno, “el Tule,” de Melaque. 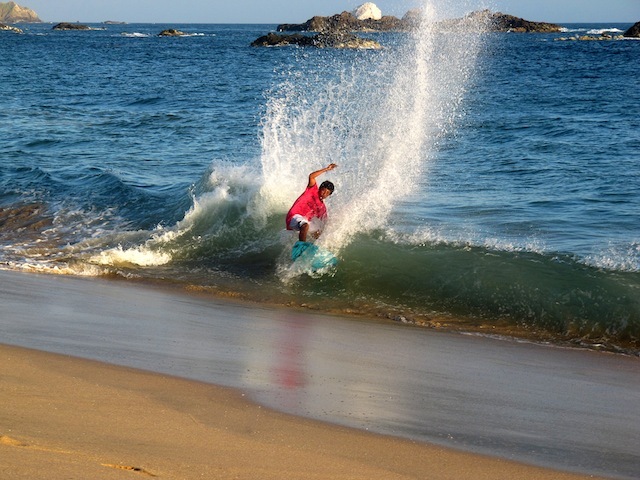 Jalisco who earned the grand prize of 5,000 pesos, beating the American, Jake Stinnett, who is considered one of the world’s greatest skimmers.